• Handles up to 15.4 sq. ft. The Rohn 45G110R120 is a complete 120' guyed tower package. Supports up to 15.4 square feet of antenna load. 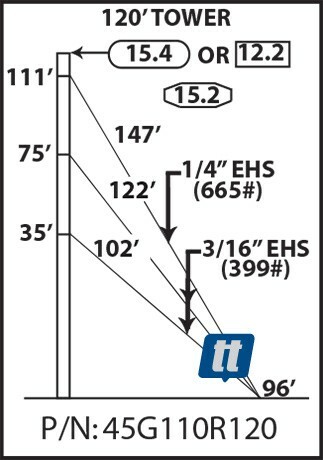 Includes 11-45G, 1-45AG2, 1-BPC45G, 3-GA45GD, 725'-3/16"EHS, 475'-1/4"EHS, 12-BG2142, 6-BG2144, 12-5/16"TH, 6-3/8"TH, 9-1/2TBE&J, 3-TBSAFETY, 3-GAC3455TOP, 1-AGK1GGX, 3-BGK3GGX, 3-CPC.5/.75, 1-3/4X12PP and all assembly hardware. PLEASE NOTE: Rohn tower packages are drop shipped directly from the factory to reduce freight cost. Typical delivery time runs approximately 2 weeks. windload capacity, 110 MPH (Revision F) 15.2 sq. ft.
windload capacity, 110 MPH (Revision G, Exp. B) 15.4 sq. ft.
windload capacity, 110 MPH (Revision G, Exp. C) 12.2 sq. ft.